It’s no secret that I am such a summer baby. That said, I do love me a bit of winter comfort food. 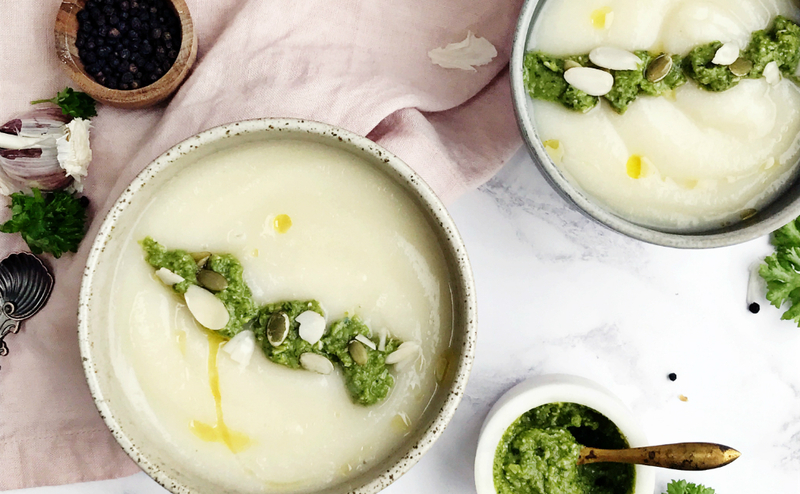 Creamy cauliflower soup is just divine, as it’s naturally sweet and creamy and the pesto lends a bit of texture and flavour. It feels so decadent to eat but it’s so good for you! If you’re struggling with a hormonal imbalance (signs include weight gain, hair loss, mood swings, poor sleep and fatigue) then increasing your cruciferous vegetable intake (like cauliflower and broccoli) can help. This is because they help the body to better metabolise hormones like oestrogen and bind to it in the bowel so it can be eliminated properly. I am very sensitive to my hormones and make a real point of having lots of cruciferous vegetables – hence the creamy cauliflower soup (topped with a spinach and walnut pesto, pumpkin seeds and flaked almonds for a little something extra). Good for the body and the soul on a wintery day! Side note: It’s obviously not winter – this post has been sitting in my drafts and I had totally forgotten it was there! Oops – sorry! In a large pot, soften the onions in a little olive oil. Add the cauliflower, potatoes, garlic, milk and stock and bring to a boil, then gently simmer for 15 minutes or until the cauliflower is tender. Using a hand blender, blend the mixture until smooth. Taste and season accordingly, add more water/stock to thin if needed. Serve, top with pesto and almonds if using, and a drizzle of olive oil.